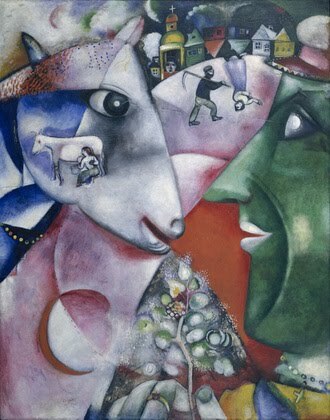 "I and the Village" is a painting by Marc Chagall from 1911. Chagall used oil on canvas for this painting and is featured in the MoMA. This painting basically interprets his memories of his native Hasidic community outside Vitebsk. Here, peasants and animals lived side by side, which is shown by the peasants face on the right side and the animal on the left. It is interesting how Chagall made these character's eyes meet. For Hasids, animals were humanity's link to the universe, and the painting's large circular forms suggest the orbiting sun, moon (in eclipse at the lower left), and earth. This painting almost looks as though it could portray a certain fairytale of the artists.